The Mealworm Feast: Prepare your savory Mealworm Zucchini Pancakes! One of our food revolutionist, Katharina. H sent us the recipe of the Mealworm Zucchini Pancakes. We are so thrilled to try it. Let's follow her recipe and prepare you own Zucchini Pancakes with mealworms! Grate the zucchini and add salt. Wait a few minutes and pour out the water. Add chopped onion and mix. Add egg, breadcrumbs, crushed garlic and pepper (and grated cheese) and mix thoroughly. Put frozen mealworms into the hot pan without oil and wait until they do not move anymore (they are dead, it is the expanding water that makes them wriggle). Then take them out and carefully add them to the already well mixed zucchini dough. Heat a large pan with vegetable oil and put in the frozen mealworms. 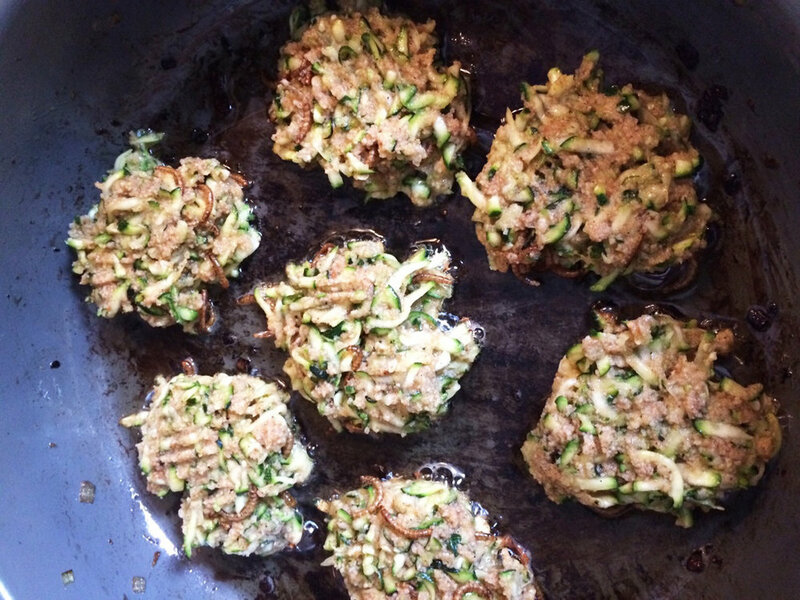 Take tablespoons full of the zucchini dough, put them in the pan and flatten them a little. Turn them over carefully when the bottom starts getting brown. When both sides are crispy put them on a paper towel to drip off some oil. The cold season is coming, we need to warm our hearts and bodies with delicious and nutritious foods and our MicroFoods deserve a good culinary match in the kitchen. Braving the rain and the first colds, I went out to my local market to see what nature and our farmers have to offer us. All these warming reddish colors and dark green leaves provoked inspiration... So, here is a revisited version of a "Hachis Parmentier"